Spent the day yesterday playing with my new toys. 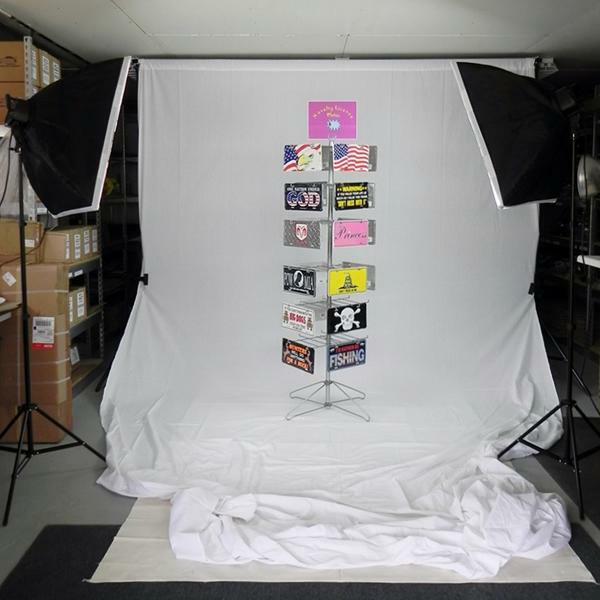 Yes I finally broke down and bought a few muslin backdrops, a backdrop support and a couple softbox lights. Had to do some rearranging of the warehouse to make room for it all but it worked out perfectly. I spent a lot of time researching different products for our new studio. We have a frequent need to take photos of new items that we’re listing on Amazon and others to include in our wholesale catalog. I also plan on doing some “what’s in the box” video reviews to post on our YouTube channel. So I wanted something that wasn’t going to break after its second use. At the same time, I wouldn’t be using it like a professional photographer, so high end equipment wasn’t really necessary nor was it in the budget. Turns out all that research was worth it. I’m pretty pleased with my purchase. The lights came from Ravelli. Each one takes five CFL bulbs which can all be independently switched on or off. This makes it easy to quickly adjust the amount of light shining from either the main key light or the fill light. Many of the reviews I read told horror stories about assembling softboxes, no directions, missing parts, etc. I’m happy to report that there was only a small learning curve assembling the first softbox and the second one went together in under ten minutes. The background support I bought is also a Ravelli and is quite simple to construct. It’s capable of expanding between a few feet to ten feet high and the width is adjustable in three foot sections up to twelve feet. This is one of the larger ones I found and I’m glad to have so much flexibility. On the downside, I went big with the support and the muslins because one of the video tutorials I watched highly recommended it. The muslin cloths, one white, one black and one green, all fold out to become gigantic 10’ x 20’ backdrops. Yes, I’m sure that one day I’ll be in a situation that requires a backdrop that size, but for now it’s probably overkill. I quickly found that folding them back up requires a second person too. Today I ordered some solid color fleece blankets to substitute for the muslins on smaller photo shoots and filming Google Hangouts in my office. They were less than $30 which still keeps the whole studio under $300. We have hundreds of products to shoot so I’m sure that’s comparatively cheap compared to having them done professionally. Got any insider photography tips? Please tell us about them in the comment section below.